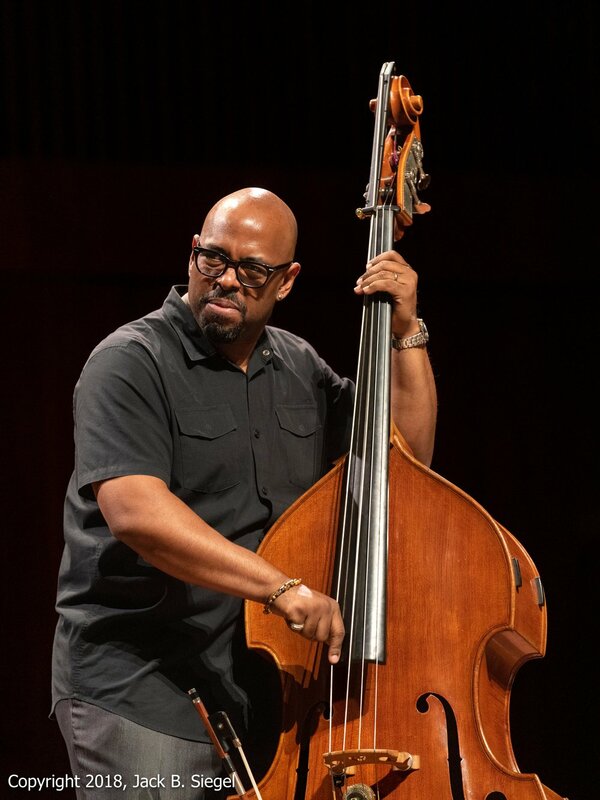 Bassist Christian McBride kicked off Jazz at the Logan’s sixth season tonight with his latest band, New Jawn, featuring Josh Evans on trumpet, Marcus Strickland on saxophone and bass clarinet, and Marcus Gilmore on drums. 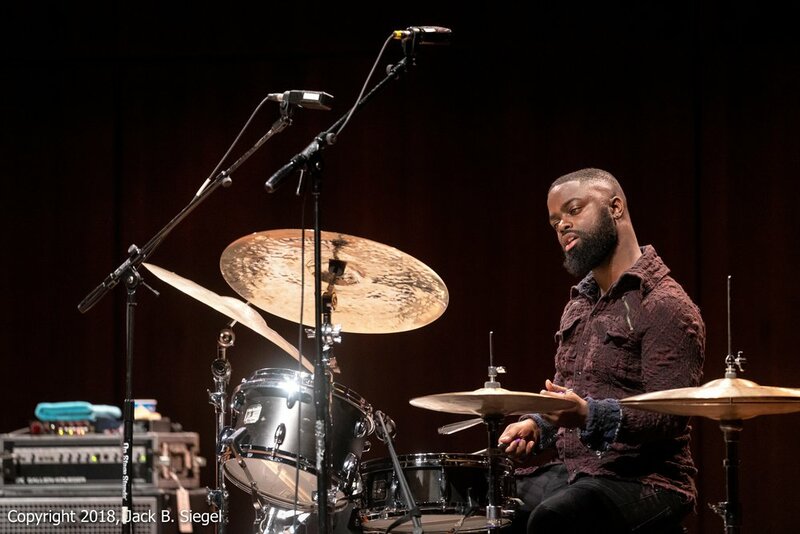 Nasheet Watts was the scheduled drummer, but a substitution was necessary, so drum master Roy Haynes’ grandson did the honors. The concert was sold out, with several people standing along the wall in the back. No surprise there. McBride is a terrific musician, who has won six Grammys; worked with countless jazz luminaries, including Freddie Hubbard, Benny Golson, Herbie Hancock, Roy Hargrove, and Wynton Marsalis; and crossed over with the likes of Paul McCartney, Sting, Carly Simon, Natalie Cole, James Brown, and Issac Hayes, to name but a few. In addition to being an electrifying performer, McBride serves as Artistic Director of the Jazz Aspen Snowmass Summer Sessions (2000), co-director of the National Jazz Museum in Harlem, and the Second Creative Chair for Jazz of the Los Angeles Philharmonic Association. McBride’s star power raises the proverbial question: Why has he reached escape velocity, while other equally talented bassists have pursued highly successful, but more jazz-centric careers? The answer was obvious at the end of his 90-minute set. McBride is one of the most generous leaders I have ever seen. 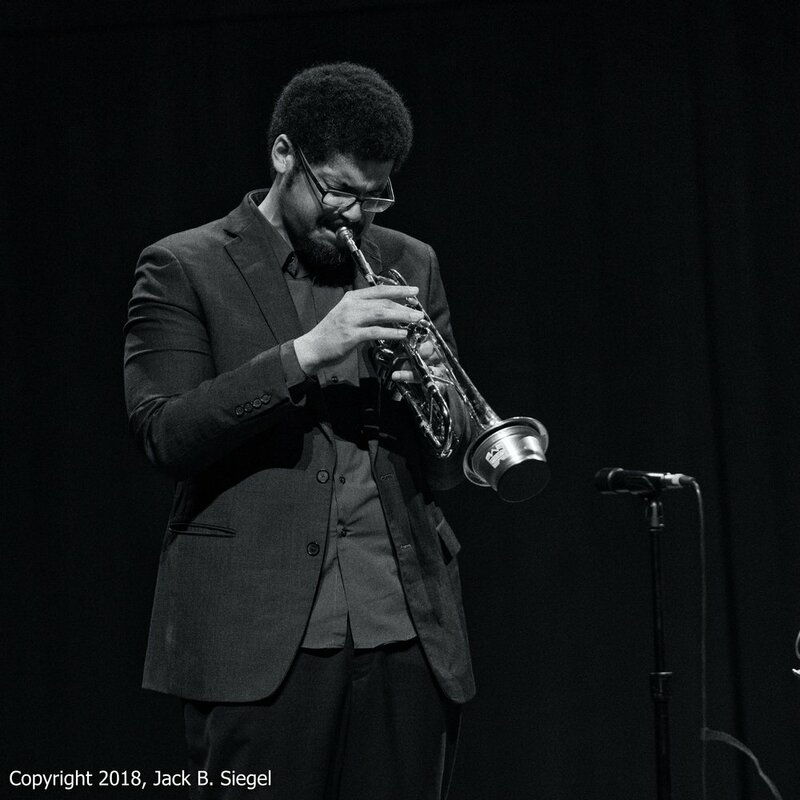 While he took the typical 30 to 40-second solos during a number of pieces, McBride only took one extended solo, and that was on the second to last number of the evening. And what a solo. The bass lines were loud in a good way, each chord was distinct, and the strings snapped back after each muscular pluck. During most of the evening, McBride left the solos to his bandmates. Early on, he gave each member of the outfit an extended introduction, with lots of biographical information and praise. He noted that Strickland and Evans were both composers, and during the evening, he featured compositions by both. McBride also gave each musician plenty of time to solo during the set. I had seen Gilmore about a month ago in New York working with Chick Corea. He was excellent and Corea certainly shared the spotlight, but I was not expecting anything like tonight’s performance when McBride announced the substitution. Gilmore did his grandfather proud, often with his head horizontal to the drum kit as he moved between gentle application of the brushes to forceful thrashing. At one point, he changed out his cymbal mid number. I’ve never seen a drummer rearrange the component parts of his kit so frequently during a set. On several occasions, McBride stared with an amazed gaze, obviously wondering what he had unleashed. Strickland and Evans were no slouches. Strickland excelled when he and McBride engaged in an enjoyable bass duet, with Strickland switching to the always interesting bass clarinet. McBride chose to highlight the compositional skills of his bandmates. Probably the most enjoyable song of the evening was Evan’s Ballad of Ernie Washington, which included his mournful trumpet lines. Sometimes I mix up the order of the songs, particularly when the bandleader doesn’t announce them immediately after the number. If I am not mistaken, McBride opened the set with another Evans-penned number, Pier One Import. Its hard bop stylings weren’t to my liking, but many in the audience enjoyed the blaring trumpet. Along the way, McBride featured a piece written by Strickland, Wayne Shorter’s Sightseeing, and a composition that is associated with Ornette Coleman and Pat Metheny, which is an interesting choice given the absence of a guitar in tonight’s band. If I am not mistaken, McBridge encored with Walkin’ Funny from his latest release. Once again, I cannot emphasize enough McBride’s generosity as a band leader. I suspect he is a congenial, fun guy to hang with when creating music, which most likely explains his fame and many cross-over opportunities. He also is a funny guy, as evidenced by his extended story about his missed opportunity to meet some guy named Barry during a 1993 visit to Chicago. Many years later he did meet Barry, who was then working under the name President Barrack Obama. Of course, the audience went crazy when McBride finally name-checked President Obama and drew a pointed, but subtle comparison to the current occupant of the White House. One thing is for sure: Bass phenom, Esperanza Spaulding would do well to take a page from McBride’s book. She is anything but generous with her bandmates, as I saw about five years ago when she performed at Chicago’s Symphony Center. Her display of arrogance was disgusting. P.S. In a very sad note, one of McBride’s collaborators, Roy Hargrove, died Friday from chronic kidney disease. This is a major loss for the jazz world.